When it comes to a horse’s health and quality of life, the condition of her hoofs will play an important role. Horse hoof problems can usually be treated but catching them early is the key. Below are the most common problems likely to affect your horse’s hoofs. 1. Thrush – This bacterial infection of the frog-portion of the hoof stems from the collection of manure and debris in that part of the foot. As the condition worsens, the horse can have difficulty walking and can experience pain. If you catch these types of horse hoof problems early, you can defeat the problem with an over-the-counter medication. To prevent the problem, you can choose a type of bedding that will be more absorbent than straw or clean the stall more frequently. 2. White Line Disease – This type of infection is caused by either bacteria or fungi that make their way inside the inner lining of the hoof’s wall. From inside, the wall begins to breakdown and can lead to a lame horse. You can treat the condition with prescription medications but the hoof will also need to be trimmed to remove the affected area and special shoeing is required until the condition and the hoof heals completely. 3. Abscess – If your horse injures her foot, an abscess can form and can lead to a great deal of pain for her. The abscess forms in the softer part of the hoof and is caused when an injury becomes infected. Your vet can assist you in treating the infection. Keep in mind that conditions, such as Equine Cushings, may make your horse more vulnerable to infections and other horse hoof problems. 4. Equine Laminitis – This condition causes horses to be lame. It can be caused by a wide range of problems, including injuries, colic, steroid medicines, and more. Figuring out the cause is something you and your vet will need to do before beginning treatment. 5. Contracted Heels – In some horses, the heels can actually begin to narrow, and this can cause the horse difficulty when moving. Although some horses are more genetically predisposed to the condition than others, the problem can be brought about by a lack of exercise and the loss of moisture from the hoof. 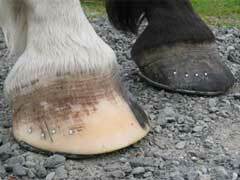 Paying attention to these horse hoof problems now can prevent further problems later. Also, watch for signs of Equine Cushings Disease which can lead to complications and make your horse sensitive to other ailments.